Chanteuse Country US née Molly Beechwood, le 18 Août 1939 à Oklahoma City (Oklahoma). Sa famille part à Beltbuckle (Tennessee), puis à tuckson (Arizona), durant les années 40. Elle débute à 10 ans en chantant "Lovesick Blues" pour Rex Allen, qui l'engage dans son émission radio. A 13 ans, elle signe avec Capitol Records et devient la vedette de l'émission télévisée enfantine Pinky Lee Show, qu' e quitte en 1954 pour rejoindre le Tennessee Ernie Ford Show. Elle passe ensuite régulièrement dans le Hometown Jamboree de Cliffie Stone. Un moment petite amie d'Elvis Presley, elle sera mariée cinq fois, dont dix ans avec le chanteur Country Ira Allen. Surnommée la "Zsa Zsa Gabor de la Country", elle sombre dans la drogue et l'alcool et aura du mal à en sortir. Son plus gros tube fut "I saw Mommy Kissing Santa Claus" en 1952. Elle a tourné dans Summer Love (1957), Chartroose Caboose (1960), The Young Swingers (1963), Corrall Cuties et Going Steady et a enregistré chez Granitie, Capitol, MGM, Liberty, Coral et Dot Records. 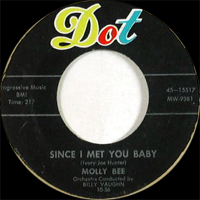 Ses titres les plus Rock 'n' Roll sont Sweet Shoppe Sweetheart et sa reprise de Since I Met You Baby, tous deux en 1956. Molly Bee est décédée le 7 Février 2009 à Oceanside (Californie). 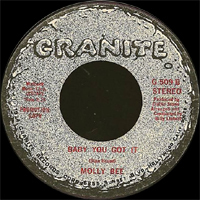 Molly Bee had several hits in the early '60s, crafting a showy stage persona, ideal for clubs. Raised in Beltbuckle, TN, Bee didn't begin singing until her family moved to Tucson, AZ. Even then, she started her singing career much earlier than most — she was ten years old when she gained the attention of Rex Allen, the singing cowboy. Bee's mother took her to see the singer at a local concert, where she had her daughter sing for him. Impressed with her performance of "Lovesick Blues," Allen had the child sing on his radio show shortly afterward. A year later, her family moved to Hollywood, where she became a regular on Hometown Jamboree, a Los Angeles-based television show run by Cliffie Stone. 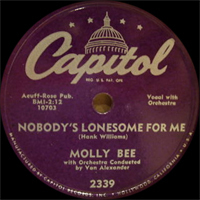 Bee sang on the Jamboree throughout her teens, gaining a large following of fans; she was so popular, the program was occasionally called the "Molly Bee Show." During this time, she was also a regular on The Pinky Lee Show, appearing on the television program for three years. When she was 13, Bee signed with Capitol Records, releasing her first single, "Tennessee Tango." However, it was "I Saw Mommy Kissing Santa Claus," released late in 1952, that was her first major success. In 1953, she recorded "Don't Start Courtin' in a Hot Rod Ford," a duo with Tennessee Ernie Ford. The following year, she left Pinky Lee's show for Ford's daytime television show. Bee's career continued to grow, as she had more hit singles — including "Young Romance," "Don't Look Back," and "5 Points of a Star" — and appeared on a variety of television shows. By the late '50s, her live shows were drawing large, record-breaking crowds. In the early '60s, Bee began to move her talents to other areas, acting in several musical plays (The Boy Friend, Finian's Rainbow, Paint Your Wagon) and movies (Chartreuse Caboose, The Young Swingers), as well as becoming a fixture in Las Vegas. However, her recording career began to decline after she signed to Liberty Records in 1962. 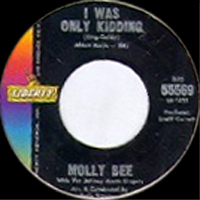 After two unsuccessful years there, she moved to MGM in 1965, releasing the It's Great...It's Molly Bee album. Bee found her greatest success at MGM the following year with "Losing You"/"Miserable Me." By the late '60s, Bee had fallen prey to drug addiction and had to take several years off the road as she rebuilt her life. 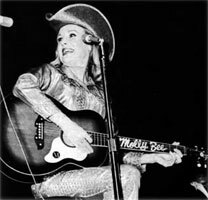 She re-emerged in 1975 with Good Golly Ms. Molly, this time on Cliffie Stone's Granite record label. Her comeback was successful, producing two charting singles: "She Kept on Talking" and "Right or Left at Oak Street." In 1982, she released her final album, Sounds Fine to Me, which failed to match the performance of Good Golly, although she remained a popular concert draw. 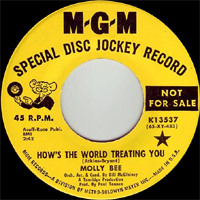 Molly Bee died on February 7, 2009 in Oceanside (California). 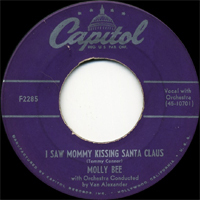 1954 SP CAPITOL F32131 (US) MOLLY BEE SINGS - I Saw Mommy Kissing Santa Claus / Where Did My Snowman Go? 1975 SP GRANITE G 524 (US) . California Country / ? 1975 SP GRANITE G 531 (US) . I Can't Live In The Dark Anymore / ?